Portland Condo sales for March were strong considering how low our inventory is. In the month of March there were 63 sales in the area that I cover, which is from Pearl District, Uptown, Downtown to South Waterfront. This includes all condos and town homes priced above $200,000. To compare, February had sales of 37 in that same area. What is very interesting though is not the increase in sales of 70%, which is not unusual for this time of year, it is that there are currently 122 pending sales. 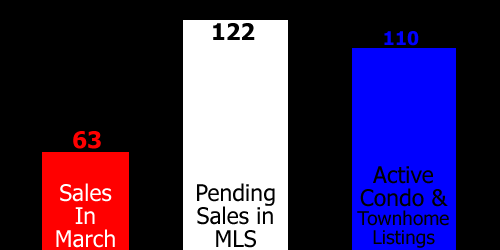 Now 122 pending sales is nothing unusual, however, what is unusual is that this is the first time since I started writing in my blog that the pending sales actually exceeded the Active listings! Currently there are only 110 Active listings in my designated coverage area. With numbers like this it could increase the numbers for appreciation in our area. While it was expected to see growth slow down some, the numbers may be higher than expected. It is certainly a sellers market with the low levels of inventory we are seeing. What will be important is the number of units that normally hit the market this time of year. As I mentioned, being a sellers market, this has been a huge windfall for the developers of The Cosmopolitan as they are getting buyers to plunk down a non refundable deposit for high priced units because of the fear of not being able to buy resale units at other buildings. If we were in a normal inventory market, I guarantee we would not see buyer’s overpaying for units. Cosmopolitan will cost you upwards of $1,000 a square foot! In my listing you could do a $250,000 remodel and still come in under $615 a square foot. Yes, sometimes patience does pay! Specializing in Portland Condos , Portland Penthouse, Portland Town Homes, Portland Highrises, upscale buildings including The Casey, The Metropolitan, Park Place, The Henry, The Westerly and many more! This entry was posted on April 1, 2015 by LuxuryCondosofPortland. It was filed under Uncategorized and was tagged with Brad Golik, Bridgeport penthouse, Certified Condominium Specialist, Cosmopolitan condominiums, Cosmopolitan on the Park, Pearl District condominiums for sale, Portland Luxury Condominiums, portland Penthouse, The Casey Portland, The Henry Portland, The Metropolitan Portland, The Westerly.